Before learning how to cook turkey, one must clean the turkey. Many supermarkets now offer pre-cleaned turkeys, which is an awesome deal, especially considering the fact that cleaning a turkey is not covered within the scope of this article. When cooking a 21 pound turkey, salt the inside with one teaspoon of salt. 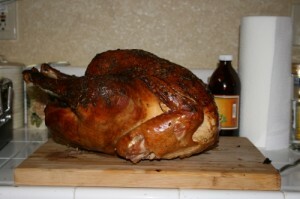 It can then be stuffed, if preferred, or just close the ends of the turkey up. Place the turkey in the pan, and cover it with 1/4 cup of shortening and a teaspoon of salt. Cover the turkey with tinfoil and cook at 325 degrees F for 7-9 hours. After the turkey has been cooking for two hours, baste it every 45 minutes until it is done. Some complimentary sidedishes for turkey are stuffing, mashed potatoes and gravy, fruit salad, and peas. If the turkey is being cooked for Thanksgiving, of course pumpkin pie works well too. Serving these dishes in a meal will provide a great variety of nutrients and vitamins. The turkey is a great source of protein, and there will be plenty of fruits and vegetables with it.